I'm very happy to announce that Therese G. is the winner of the Craftsy class giveaway. Therese, Craftsy has sent a link for you class directly to you. Thank you!! The winner of the second Craftsy class is Margene!! I may have squealed out loud this morning as I counted and landed on her name, and I couldn't wait to send her gift! Since she recently expressed her interest in Alabama Chanin style sewing, I'm pretty confident that I know which class she'll choose. Thanks for all the 10-year fun. I've written over 2500 posts in the 10 years I've been blogging and shortly -- very shortly -- someone will leave the 22,000th comment on one of those posts. The milestones just keep coming! I scored some new 4XL men's t-shirts the other day -- so much fabric! I couldn't wait to start deconstruction and am already busy making another top! This one is a mash-up of two favorite styles for summer. This weekend, though, I really need to finish knitting a hat I've had on the needles for too long! And work at getting rid of a cold. Yuck. Maybe it's the world telling me that it's House of Cards S2 weekend at my house. heh. When the message came from Craftsy I jumped up and down! It never crossed my mind I would be a winner, as reading your blog is win enough. Truly! You have no idea how many times you've inspired me. I've riffled through Smith's drawers and found several t-shirts he won't miss. 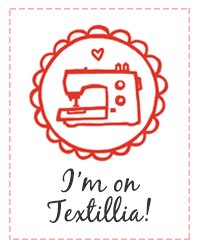 Alabama Chanin here I come! I'm so glad for Margene! Congrats again on your 10 years, Vicki. I so enjoyed your 10th anniversary tribute - thank you for compiling and sharing all of it! ...and I think you have the perfect excuse for HOC s2. I'm saving mine til Marc's out of town for a few nights and I'm not sure that's going to happen soon enough! Get well. and enjoy! I just have to say HOC S2 OMG. What a wild ride.